Dom do you play pickup basketball at all? It's been a while. However, I grew up playing basketball and even played throughout high school. I always feel like going out and playing during the playoffs, but I don't really have any friends that play. Oh ok just asking since I know you have knee problems with playing soccer. I just got in to basketball myself and I've become really attached to it. Once my soccer season is over I'm going to be playing a ton of basketball. Didn't you have some muscle or ligament problems that you couldn't play soccer? Low risk. The Heat are stacked. So shorten the regular season to add essentially another playoffs? Does the team that win the cup play the NBA champs? Doesn't seem at all practical. Not to mention that teams would probably use it as rest for the postseason and play their rookies. Man I hate Beasley so much. Came to Phoenix for a pretty hefty contract and did absolutely nothing but get arrested. I hope he fails for the rest of his career. What an ungrateful piece of $hit. Also how highly do you guys rate Gordon Hayward? Do you think he can be a superstar in this league? I like Gordon Hayward. He's a solid SF, I don't think he'll ever be a superstar but he can be a 18+/- ppg scorer on that Jazz team. Especially with Al Jeff and Mo gone, he will have more of a role on offense. The Sacramento Kings will broadcast 11 games commercial-free next season -- including the home and season openers. Also broadcasted without commercials will be the following games: Dec. 1 against the Golden State Warriors, Dec. 27 against the Miami Heat, Jan. 17 at the Memphis Grizzlies, Jan. 24 against the Indiana Pacers, Jan. 26 against the Denver Nuggets, Feb. 1 at the San Antonio Spurs, Feb. 28 at LAL, March 15 at the Chicago Bulls, March 28 at the Oklahoma City Thunder, March 29 at the Dallas Mavericks. The Kings hope that it enhances a fan's experience. Derrick Rose's game might evolve a bit in his first season back from knee surgery, but the Bulls star's stance against recruiting free agents to Chicago hasn't. "I don't recruit. If anyone wants to play with me, I don't mind playing with, it could be anyone in the NBA, but as far as recruiting, I never did and never will," Rose told rappler.com, a social news network, in a video this week. Rose passed on recruiting free-agent stars LeBron James, Dwyane Wade, Chris Bosh and others in the summer of 2010. However, he apparently made one exception to his rule last offseason, when he said he helped bring in Kirk Hinrich. "Kirk is someone I could see playing alongside a long time," Rose said last October. "When you're a hooper and you know someone on the court is going into a battle with you, and he's not giving up if he knows you are going to keep battling and I'm someone that will keep fighting to the end, and he's the same as you, so why not have him on the team? Kirk is the first person I recruited." MIAMI -- So long, James, Allen, Pierce and Garnett. King James, Jesus Shuttlesworth, The Truth and KG may be headed to the backs of NBA jerseys. Some members of the Miami Heat have been told the NBA is considering having them and the Brooklyn Nets wear "nickname jerseys" in at least one of their four matchups this season. The NBA has not announced the plan, but teams apparently have been aware of the likelihood of it happening for at least several weeks. For now, only the Heat and the Nets would be taking part. It's unclear how many times those teams would wear the nickname jerseys, or if they would ever wear them against other opponents. "It shows growth in our league and it shows we do adapt to what's going on around us," said Allen, the Heat guard who plans to wear Shuttlesworth on his jersey, a nod to his character from the "He Got Game" film. "And we're still kids, playing a kids' game. Even though we're now men playing a kids' game, we still remember where we come from. Everybody had a nickname and it's a way to let the fans in a little bit more." Players were asked to submit what names they would want on the jerseys. Four-time NBA MVP LeBron James is expected to wear "King James." Heat guard Dwyane Wade would have any number of nicknames to choose from, with "Three" -- both his jersey number and championship-ring total -- being his current favorite. He could also go with his more commonly known name, "D-Wade." Brooklyn forward Paul Pierce has been called "The Truth" for many years, and fellow new Nets forward Kevin Garnett has long been known by his initials, or "The Big Ticket." The Heat and Nets are among the preseason favorites in the Eastern Conference, which Miami has won in each of the past three seasons. Miami forward Shane Battier -- who wasn't exactly thrilled about the nickname idea -- said he wanted to wear "Batman" on his jersey, though was told that Warner Brothers holds the rights to that name, and other players have also had to deal with copyright-related issues with their suggested monikers. Battier said he'll go with "Shaneo" instead. "Fans will like it and so will a lot of the players," Allen said. "Guys will get a good kick out of it." Some of the reaction around the league wasn't supportive of the idea. "The nickname makes it more about the individual," Kendall Marshall of the Phoenix Suns wrote on Twitter. "It's still a team sport. Represent your team, your family, and go out there and play." Meh, bit gimmicky but no harm done. Shuttleworth is a jersey I would be happy to rock though. Can't wait for their first game in January. Preseason has to be starting soon. DWade getting pissy, duno why. Durant isnt exactly wrong. 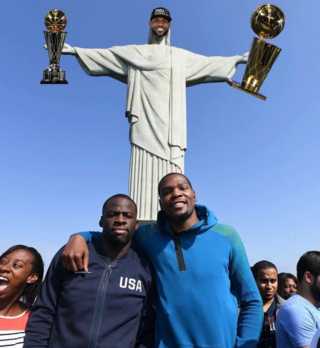 Durant's place in history will be passing DWade up within 5 years tbh. Nothing wrong with Wade taking it personal. Afterall, when he's healthy there's no question he's still top 10 in the league. If Durant doesn't win at least one ring, sorry, he isn't passing Wade. And don't say there's "no way" he won't win. There's still a Lebron. A Rose. Dwight+Harden, etc. There are many factors that can stop him from winning. Durant wishes he could pull off Wade's 2006 run. @Blue Barrett wrote: Nothing wrong with Wade taking it personal. Afterall, when he's healthy there's no question he's still top 10 in the league. If Durant wins a single title as "the man" he's surpassed Wade. Don't act like '06 Shaq was LA Shaq. He was good but its not like he was overly dominant. And no you can't just assume he'd pull that off. If it was that easy a lot more people would have done that. I'm talking about arguably the most dominant Finals performance ever. What exactly did Durant do last year when, granted he lost Westbrook, but he choked so bad. Even a half better performance in some of those games might have given OKC a better chance. Not saying he's not clutch(he's proven that already) but its one thing to have clutch moments, its another to have a clutch and massively dominant Finals series. And quite frankly, I doubt he could even play with Shaq but that's just me. @Blue Barrett wrote: Don't act like '06 Shaq was LA Shaq. He was good but its not like he was overly dominant. First off, Shaq's '06 numbers per 36 were right there with his last title year(01-02) in LA. Not only that, he shot a higher percentage, rebounded better and blocked slightly more shots. Put Shaq on a Wizards that year and Gilbert fkn Arenas is an NBA champ. Second, his best players when Westbrook went down were Kevin Martin and a underwhelming Serge Ibaka. What did Wade do with Ricky Davis and Mark Blount? The only thing correct about what you just said is that he shot a higher percentage, and that's understandable, considering he shot a lot less and was generally picking his spots as opposed to "taking over" like he did most times in LA. And you bringing up Ricky Davis & Mark Blount is irrelevant because I'm not even talking about K-Mart & Ibaka. Durant is so good at piling up garbage points(because he's a great shooter). He averaged 28.6ppg in the Memphis series but averaged only 3ppg in the clutch that whole series. How do you explain that? And I didn't even mention his crucial turnovers. Put a healthy Wade on that Thunder team last year and they at least push Memphis to 7. Doesn't even make sense to compare KMart & Ibaka to any of Wade's teammates pre Lebron(08-10). He never had a shooter like KMart or the league leader in blocks on his team. Not to mention he faced the eventual finalists most of those years, if I'm not mistaking. Fact is, Durant while he's better than Wade right now, hasn't done achieved as much as Wade has. At his age Wade was already a champion. You may bring up a few twists to that argument but then again his relative age mate Rose is already an MVP as well. A few scoring titles hasn't don't matter here. T-Mac won scoring titles too. Wade's 08-09 season >>>>>> Anything Durant has put together right now. And I repeat, Durant isn't TOUCHING Wade's 06 run. On the Harden thing, when healthy anyone would be foolish to take Harden over Wade. Or just downright being a troll but sadly Wade hasn't been healthy this past 2 years. Wade having one of his worst seasons since his rookie year(12-13) still put up better stats than Harden apart from PPG. I don't even know why its an argument.